Check out the tie-dye shirts I made ahead of time here. For the day of surgery make sure to bring your own shirt that you are OK with cutting down the side, or at the very least a very large stretchy shirt. Stretchy shorts or pants are always good to pull up since you will be in a gown for the procedure. The morning of surgery, I wrote “This one” on the arm that was having surgery. In reality, wrong side surgeries are not uncommon, so it can’t hurt. I also wrote “wrong arm” on the non-affected side. I don’t actually know that this is a good idea, but it made me feel better. 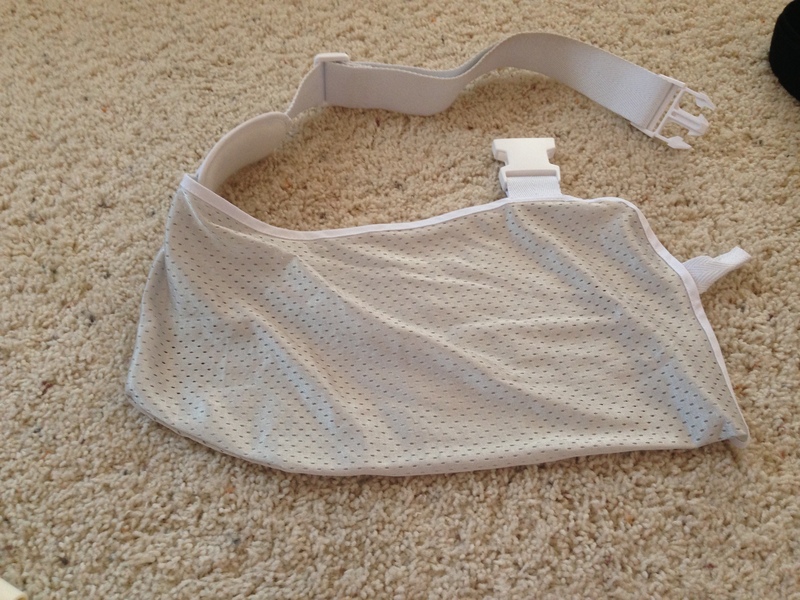 Ultrasling (aka your new bff) – you should be given this before surgery so don’t forget to bring it! When you wake up, they will probably have already put the sling on. I recommend getting it fitted before you go in. If you have food allergies – bring crackers, rice, or something small you can eat! No food = no pain killers. You can’t take pain meds when you wake up until you eat. Since I’m gluten free, the nurse couldn’t give me their crackers. I ended up ordering eggs from the hospital kitchen’s dedicated gf area, but really shouldn’t have eaten that much. I felt nauseous on the car ride home. There are a few tools that will make your recovery time much easier, especially when it comes to cooking and bathing. If you live alone, the cooking tools will be especially helpful. Button hook $9 – I did not end up using mine, but if you have to go to work, or plan to wear button downs, it will help link or DIY here (these work almost as well as the real ones – and you probably already have the materials- spoon, paperclip, & tape). Spray on deodorant. It’s tricky to get deodorant up in there. It’s also a great idea to do some meal prep and freeze your favorites before going into surgery. Have the expectation that you will not be able to cook real meals for at least two weeks, so around 20-30 individually portioned dinners/lunches are a great idea. This may sound daunting, but usually a meal serves 4-6, so it’s really just between 4-6 full meals divided up into small tupperwares! For some more ideas or pre-made shirts you can buy, check out my pinterest board for surgery. I am guessing you, or someone you know is having surgery and that is what lead you to my site. Please check out parts 2, and 3 plus how to make your own t-shirts on the rest of the blog! Thank you for stopping by, and best wishes, on your surgery and road to recovery. You will make it! I will be sending happy thoughts for your surgery and healing vibes post-op! Not sure if my other comment went through or is in moderation or what, but thank you SO SO much for these posts. I’m having my capsule tightened, too, from regular dislocations. Sarah, I still don’t have full range of motion, but my PT and I feel that’s a good thing. One of the most important pieces to the puzzle is having a good PT who understands to take it slow. You don’t want to loosen all up again, especially too quickly. I will try and outline some details for you, but I was out of the sling around week 6. More to come! p.s. I just ordered a tie dye kit for t-shirts! So happy to have found this! I have the same issue– and I’ve never met anyone else who does! I have frequent sublaxations that have been increasing in frequency. We were doing an MRI, and prepping for surgery to tighten the joint. But the most recent MRI confirms a newly torn labrum due to all of the dislocations 😦 so they’re repairing that as well!! How are you doing now?! I know that I am not a woman, but good information is good information. I live alone and did not want to bother my family too much after surgery. I do not remember which blog post it was from, but I saw something about post surgical clothing here . I checked it out and was pleasantly surprised. In this article, you linked to some one handed kitchen utensils, which were also awesome. I bought a Top from reboundwear.com when i was having my shoulder surgery and it was super helpful and the great thing is i still wear it after my surgery because it looks like a regular shirt. Thanks for taking the time to write this list out for people. Tube top dresses are helpful as well! This was great. I am getting the same (sort of) surgery in about a week, and I have been trying to prepare as much as possible. I LOVE the tshirt idea. They will be tightening my shoulder capsule with anchors drilled into my bone. I am having the same problem you had, except with full dislocations instead of subluxations. I will definitely be bookmarking your stuff to look at as needed while I’m getting ready for surgery! Thank you for stopping by Alex and best wishes! I have EDS too, but no one has suggested tightening the joint. I have two tendon tears, a labral tear and an osteophyte that needs to be removed. My surgery is in 3 weeks, and your blog, tips, comments are helpful. Thanks for them. How do they tighten the joint? There are multiple surgeries that could be performed – one being a capsular plication/nip & tuck. They can be done open or arthroscopically. I would recommend talking to your orthopedic surgeon to see if they are able to consider one for your specific situation. A second opinion is never a bad idea either, if you are looking to do a different or additional surgery. Hugs to you on your upcoming procedure and thank you for your comment! I read through your post before having shoulder surgery in May. I am having the same shoulder re-done this months and am finding myself reading through your posts again. This is #3 in shoulder surgery for me (same shoulder). You would think I am an expert after having gone through it twice, but one forgets. Thank you for writing down your experience. It definitely helps to prepare for it. I’m so glad it has been helpful, Isabella! It can be easy to forget the little things. Sorry you’re going through another round. Best wishes. Thank you so much for these posts! It’s nice to know that someone else has had capsular plication and has had success! I’m having mine done for multidirectional instability (also caused by EDS) tomorrow morning! I’m excited to be done with the pain and dislocations, but I’m nervous about the recovery for sure! 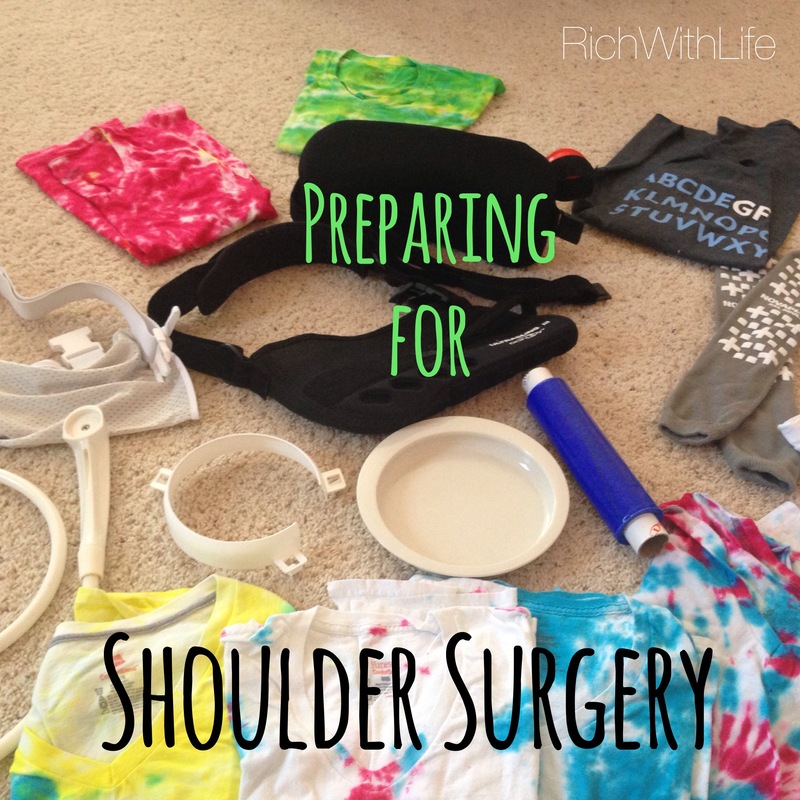 Appreciate reading your thoughts on shoulder surgery, finding this is a blessing! I am having “Ac joint reconstruction with graft” on Tuesday and I am totally dreading it. 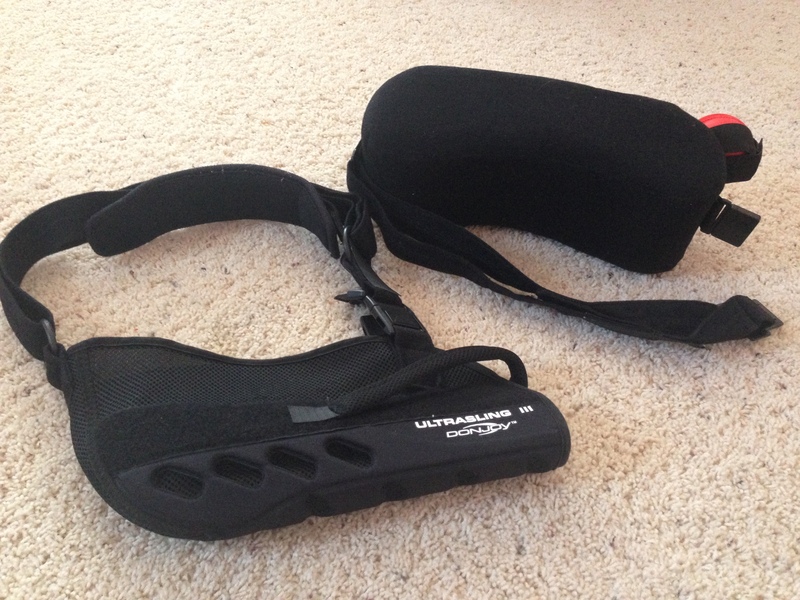 Four weeks in an immobilizer sling and a couple months of PT. I live alone and the food thing is not going to be easy. Not sure I can make all those meals with the time I have left. I’m 64 and hope I can get through this.. 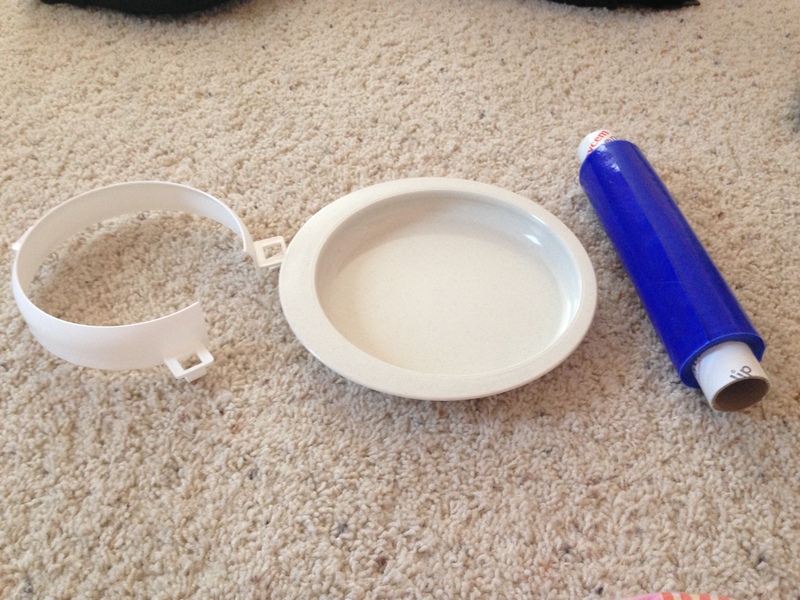 I don’t understand what the photo is of the three items, a roll with something blue on it and what looks to be a white bowl and something else. Thanks for this again, really awesome! Thanks for commenting! The photo you’re referring to has a roll of Dycem material which is sticky and helps things on the counter not slide so you can do things one handed. And the other two are a plate guard and a place with a rim on the edge- these help with eating one-handed because you can scoop food on the edge of the plate/bowl. The one is universal and attaches to many plates. The other is just a special plate made that way. Best wishes to you in your recovery. UberEATS/food delivery apps and sites along with easy heat-up food are your friend too- don’t feel intimidated by trying to cook everything! There is a lot to worry about so if you need to splurge on take-out food, I say go ahead. That is very interesting Emily thanks, going to order some of the Dycem today. There is one big area of concern is icing. Living alone there is no way I can do the ice machine, how did you manage cold therapy? Uber eats sounds good too, great idea! Ice packs will work. More bend in then the better! Thanks so much for these posts! They are such a blessing. I am getting surgery on February 15th to tighten up my shoulder joint (from frequent subluxation/dislocation) and fix my torn labrum. I am kinda scared, but it is comforting to know that others have done it and gotten through it! I am now almost 6 months post-op…and I recently re-injured my shoulder. It is now the same, if not worse, than before surgery. I am not sure if another surgery would be at all beneficial, or whether I should just try and deal with the pain. Do you have any thoughts or advice? Thank you so much! Oh no, Rachel! I am so sorry to hear this. I really cannot advise you on this. But I would say to go with your gut and the advice of your orthopedic surgeon. Depending on the nature of your re-injury, pain level, potential for nerve damage, and likelihood of re-Injuring again, I am confident you will be able to make the right decision for you individually. But I can only imagine how hard that thought process will be. I can recommend following up with a therapist though (OT or PT) regarding pain management and discussion of options. Hugs! Thank you! My surgeon decided today that I need another surgery…so round two begins September 13th. What a Sweetie you are for doing this Blog! I’m having Rotator Cuff surgery soon and I so wanted to figure out what kind of shirt to wear and bra…you answered everything so well. I’m so glad it was helpful. Sending well wishes to you, Diane! My husband is having shoulder surgery in 10 days. Thank you for putting together the list of essentials — we are purchasing them today! Thank you so much. I am about to go into my second shoulder surgery and was looking for a way to make it easier than the first. I think your articles were just what I needed. Thank you!